Care becomes complex when an individual has more than one debilitating diagnosis, for example, someone with Parkinson’s AND diabetes. It can become a challenge to keep track of the different care instructions, medication interactions and conflicted needs of someone who has multiple chronic conditions, and therefore multiple doctors and care providers. Our staff is knowledgeable and effectual at efficiently bridging these challenges. Residents who have complex health needs may require medical skilled services as well as other types of support from a variety of care providers. We take the time to understand what conflicting issues may arise from their complex needs, and coordinate those care needs with their respective physicians, home health and hospice care providers. A primary source of conflict in care is the combining of different prescriptions from various physicians. One of the first things we do for a new resident is to compile an accurate list of all of the medications, for review and coordination by the prescribing physicians that have been involved in the new client’s care. Taking full time care of a loved one is a labor of love, yet it it is also a complex task. At some point it will become too much for one person. Sooner or later, the care provider suffers exhaustion and more, which has an effect on the quality of care given. It becomes a vicious cycle detrimental to both individuals. 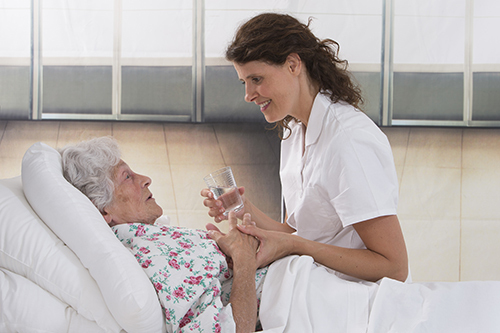 Our loving staff will provide quality full time care for your loved one. You can become the care manager, rather than full time care provider. Together we will be caring for the whole person. Residents of The Meadows can expect to receive compassionate and comprehensive care that addresses all of their complex care needs. If you’re interested in learning more about our services and personalized complex care plans, please don’t hesitate to contact us. We’re always ready to assist you and address any concerns you might have.